I specialize in sustainable tiny home design and enjoy consulting projects of all sizes. This is a helpful guide for home building or remodeling of any size project. It will give you the pros and cons of the choices you have to make along the way so you can make the most informed decision possible. If you have received a free copy of this guide, please consider making a small donation to our non-profit Helping Hands Network by emailing tfrentz@hotmail.com for payment options. This guide is also very helpful for those that are relying on a general contractor to treat them fairly and make the best quality decisions possible on their behalf within the agreed contract pricing. I recommend you retain your general contracting rights and contract each stage of the project on your own. It is a difference in paying approximately a 33% mark up on every single process. In the end, it is the difference between paying closer to $66,000 instead of $100,000. Most of the time, these decisions are made because of increased pressure on the home owners by the lender. In most cases, lenders will have some qualifications that need to be met before approving the loan. This just means that you need to find a construction friend that can sign-off as a general contractor on your behalf. The main qualification hurdle on a whole home build loan is that you contract a professional framer. Beyond that, most of the other processes are more lightly regulated by the lender. I strongly urge you to save up your cash and only build a little at a time as you have enough funds without financing from a high interest rate lender. By doing this you limit the chains that prevent you from living freely out of debt. This guide is written in the order of a new construction process from the planning to finishing stages. Prices change often and vary by region so I do not list them in this guide. You will need to look up current pricing for your area as needed. The more cash and credit you have available, the easier it will be to achieve your goals. However, do not feel that a project is beyond reach due to a lack of available finances. I have completed some amazing projects with resources acquired through barter, thrift, salvage, auction and even scrap yard hunting. Once you have completed your first wave of resource planning through all discounted methods, it is time to begin looking for the products and services that you will need to pay more for. Keep watching for deals from the first phase of resources but get your plan B in order. I will give examples as this guide goes over each section of the process. Price estimates are based on a 2000 sq. ft.; 3 bedroom, 1.5 bath home. After you have a resource list organized, you are ready to place them in a blueprint of your project. After you have a blueprint, you will know how many items or how much material you need. If this is a complete structure build or remodel, you will need to obtain the property or a trailer to put it on. You can now pick a location that may have some of the natural resources you need in your design plans. It is best to obtain free property from family or homestead an unclaimed territory for new building but if you must resort to buying, try to avoid a realtor at all costs and contact private sellers. If you have trade skills, you can use them to build a friendship with the owner of a property you have your eye on. Do enough projects with them and you will likely get a nice discount. While reviewing land, look closely. Are there any trees in the way of building equipment? Are the trees in the right location for shade? Are there any food baring plants and trees? Are there enough lumber trees to burn for heat on cool nights? If there is a natural spring or running stream you can have drinking water and the ability to connect a hydro turbine for electricity. If there is a hill, you will be able to form a swell wall to catch rain in a pond and gravity drop your plumbing to avoid city or county utilities. Do you know what the outdoor burning rules are so you can minimize your non recyclable waste? What is the ground content? Take a shovel and dig 2 feet down if you can because the content of the ground determines your options and how expensive the foundation and power will be. A solid foundation pad is a must. If you cut corners on setting your foundation, the rest of the house will fail long before you are gone. If you build on top of soft dirt or sand your house will settle and potentially brake windows, doors, walls, tile and much more and you will end up removing and replacing everything you planned so hard to save money on. Hopefully the property has some form of long lasting material to base the foundation. Ideally you want a hard wood forest on site so you can hue the logs, tar them and build on top of those that have a long shelf life. This land will most likely have enough soft spots that geothermal tubes can be placed 30 feet into the ground to provide heat and cooling. If the ground is hard, you will only need to pay for a leveling service. Make sure they clear a path or driveway also while doing the pad. Chances are that a soft area for geothermal will not be available and drilling would be too expensive so other renewable energy solutions will need to be considered. Building into the side of a hill and doing an earth roof will increase your homes climate comfort while minimizing the need for heating and cooling so hopefully your land has plenty of free “earth” to use. Building into a slope on one side of your home will also protect your family from tornado type storms. Basements are an added expense but if you are in a strong storm area, you will want to consider a small shelter room that can double up as a panic room and valuables safe. But for most purposes, building into the side of a hill will provide safety rooms along that one side. A standard leveling charge for a service where the removed layer remains on the property is around $2000. Hard rock/ore delivery plus compacting services will cost around $8000. A medium sized poured basement is around $12,000. There is no reason to pay to have your earth hauled off. There will be plenty of landscape uses for it. I strongly encourage you to consider building naturally. Commercial lumber, drywall and paint is all processed with chemicals that your body absorbs over time. Adobe, straw bale and natural wood along with other repurposed materials should be researched before using any commercial products. If you must use commercial products, standard pine lumber does fine and unless you are doing mostly glass walls, you do not need any metal framing. On a earth wall, treated lumber with waterproof wrapping and prepped gravel and draining measures will be needed. The most important parts of commercial framing include having treated 2×6 base plates on a solid foundation with proper drainage, 2×8 floor laminated veneer lumber (LVL) beams, high weight baring ceiling trusses and properly supported weight baring walls. Any external wood wall structure needs to be wrapped in waterproof sheeting. This also improves insulation values. The typical 2000 sq. ft. home will cost about $14,000 to frame with commercial products. Using natural products will reduce this cost tremendously. Porch easements are included in framing but not deck and sun room additions. See “SURROUNDING” comments for details. There are many options for roofing and it is easy to over think and get overwhelmed in the decision. An earth covered roof is the longest lasting with proper installation and maintenance. Treated plywood with a layer of ice and water shield covered by rubber rolled roofing is the best way to waterproof the roof. Put a shovel scoop of gravel down before each section of the sod to keep roots from growing into the rubber and to keep the sod from eroding away in high winds. Framing needs to be done with 2×6 walls to support the extra weight but the benefits are well worth the minor increased lumber cost. The earth roof will filter out dangerous radio waves and radiation but yet allow a decent phone signal through. Metal roofs require special tools and a lot of expensive screws, custom edge pieces, and ridge and end caps. If the pitch is not steep enough, rain will make a very annoying loud pounding noise. Extra insulation is needed to keep the noise muffled. Metal will disrupt radio waves so if you rely on cell phones you will want to consider a copula bell tower with windows to hold a range extender to improve your reception and data flow. Asphalt shingles are inexpensive and easy to repair and maintain and do not filter radio waves as much as metal. Wood shakes and clay tiles are expensive and pricey to maintain and repair. SunFlare has a solar film wrap. The most efficient heating/cooling system to install will cost about the same as a traditional system. The only headache is that the Sterling Engine will take some self training to repair if it ever acts up. A sterling engine uses far less energy than a natural gas furnace and electric air cooling condenser. Here is an example of a Sterling engine on a geothermal system by Cool Energy of Boulder CO. The only change I recommend is switching to an inline on demand water heater instead of the water tank. Tanks cost the same price and have more maintenance issues and take up too much space. A Sterling engine works by using the pressure created by temperature change to move the engine pistons as needed. This means that in a geothermal system, there is no need for gas or electric power input to drive the system. It is completely powered by the change of the temperature alone. The higher the range of temperature in your area, the more energy it creates. The city of Boulder, CO is a leader in renewable energy implementation and design and they use several SolarFlow Systems. I recommend having the HVAC unit wired to the grid as well as to the Sterling (SolarHeart) engine just in case one or the other has problems. There is not much to plumbing. You need a constant reliable source of fresh water like a well, stream, lake or pond; a digester for waste; and a heating source. 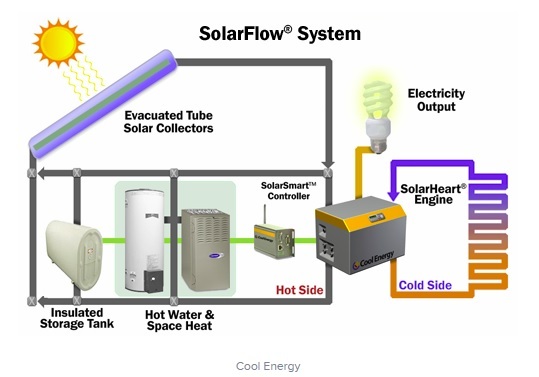 A raised water tank or up-hill source provides the needed water pressure for showers while an in-line water heater powered by a single solar panel system with battery backup will provide all the warm water you need. If the main water source is a pond or river, you will need a pump powered by a water wheel turbine or solar system to move the water uphill to your house unless it is channeled from a higher elevation. If that is the case, your land is in a high danger of being flooded often. Make sure your water lines are pex tubing and that they are not installed on any external walls if you are in a region that gets below freezing. You will want to find a good deal on a UV filtering system also. You have no idea what is in bottled or public water sources. Rain water will have the least amount of harmful chemicals but near large industrial plants even the rain water is likely to be contaminated. A UV filter system is the best way to be certain you have minimized the risk of your drinking water. Consider an incinerating toilet by Incinolet! With the framing, roof and main plumbing lines done, electrical wiring can be setup. There is not much to be decided. The main choices you have to make are where you want outlets, switches, speakers, fans and such located. You will want to obtain a code book from the local utility office to help you. Make sure your fuse breaker box is not outside. It is no fun to go out in the weather to reset a breaker. Anything outdoors is also a target for vandals. You can buy the wire at a contractor supply wholesaler or through an electrician friend and do some quick research on the codes in your area. When running wire, drill holes in the middle of the wood and tack metal plates over the holes on the interior wall side of the holes to prevent wall nails from penetrating the wiring which could result in shorts and possible fire. You need to use wire staples to hold the wire to the studs at least every 12 inches to prevent it from being punctured by wall nails. Make sure you use the proper gauge of wire for the items being used on the circuit. You will want to review your wiring diagrams with an expert to make sure you are running them properly and then you just need to pay a licensed electrician to connect everything for the inspection. You will want to have as many windows as possible to limit the need for electrical light but when you do need them, pick Light Emitting Diode (LED) lights to minimize the energy dependence. Make sure you wire for renewable energy sources like solar panels, a backup battery bank and a grid tie inverter. Run as much of the wire as possible underground to limit electric pulses surrounding you and minimize interference. This usually is limited to the main line running from a utility pole to the fuse box. Make sure your fuse box and the connection point of the main utility line is properly placed for the line coming in from the utility pole. It is a common mistake to place a fuse box and hook up in a location not serviceable. This means that thousands of dollars in running wire could be wasted if it has to be pulled and relocated. The expense can grow very large if other finish work like drywall and such would need to be torn out for a rewire. I recommend getting a pre-packaged Tesla Pack. Here are the details and videos. NCR18650B – $16 per 100w of power storage. Most efficient & close to the best price available. BUT SHIPPING & WIRING VARIES ON QUANTITY and the unit available. Tesla 3kw Module: ($25 per 100w) $750 /ea. unit. Full power pack WITH A COOLING SYSTEM. No extra wiring needed to save time for near the same cost of purchasing smaller units and connecting them together. If you want to DIY, here are some links for materials to build a Tesla Battery Bank to hold extra power from your solar generation. As valuable products begin moving into the home, the doors and windows need to be installed. These are very simple and you don’t need to pay a builder to do a task that a couple of friends or family can help you do. Unfortunately it is hard to find a builder who is willing to allow home owners to get in the middle of some projects like doors and windows. Most of the time owners just give in and overpay to have the ease of mind and smooth progress. Two key things to remember include, insulating the gaps and taping over the outside edges to water proof them before stone work, siding, flashing and trim begins. After plumbing and electrical holes are all in place through external walls, you can start installing accent features like stone or brick. I recommend at least one third of the outside be done in a durable long lasting resource. There are so many external product options that a person can go insane trying to design and decide their ideal finish. The longest lasting, easiest to maintain and most affordable options to compliment the stone includes barn wood, hardwood logs, and steel panels. These do not need paint maintenance. Hard wood logs need to be from a species that no pests are attracted to in your area. Do your research. Poplar is one I prefer. Cedar is the leading choice for fascia and trim because it is rot resistant. Vinyl and standard wood siding require a lot of maintenance costs. Vinyl fades and cracks easily. Base wood siding products need excessive nailing, paint and caulk which doubles the cost. The ridge on most horizontal wood siding attracts dirt, mildew and webs. Concrete (Hardy) board siding is durable and allows custom color finishes but has far too many disadvantages. It chips under pressure and is hard to repair. Labor costs are 3x the cost of other options because it is messy and requires special tools. It also needs trim nailed on seams and needs caulked and painted. It does not miter well for trim. It also makes a dangerous dust that gets in your eyes and lungs when being cut. For soffit, I prefer wide 1/2 inch thick wainscot planks with tongue and groove laps treated in polyurethane. Vents just attract dirt and insects so I just drill small holes for ventilation. My second choice is a vinyl paneling. Do not go with aluminum because the paint fails and the slightest of dings are permanent. Some minor dings can be reversed by placing a heat gun over the dent but it is not guaranteed. Aluminum soffit is also hard to replace. Wood rots and cement hardy board chips so I do not recommend using them. Dirt and webs also stick to them and are much harder to power wash off. The wood should be treated or rot resistant and it should be covered in aluminum. An 80 ft. by 3ft role of coil costs about $100 and a bending machine can be rented for about $50/day. There is nothing complicated about doing this. After installing the metal, make sure to seal the edges with caulk and your fascia will look like new for a long time with just occasional washing. This will also keep pests out. Make sure all the edges are sealed with water proof tape and have metal rain flashing installed. Now, add any wood frames you want and then use the same materials as the fascia over the frames unless you are adding some nice stone or brick highlights. This needs to be done before the stone or siding goes on. Controlling the flow of water near your foundation is critical. Installing gutter at the right angle will take two people but it is a simple “DIY” project. Long seamless runs of gutter are nice but they are not worth the cost of custom ordering and the hassle of installing. Install the down spouts of the gutters to barrels so you can channel the excess water into your gardens and home plumbing system. The standard r30 rated rolled insulation is great for walls but if you have a metal roof you are going to want to add some blow in insulation on top of it to drown out rain. That also means you can’t have vaulted ceilings. Insulation requires no special skills to install so save some money and get your friends to help with this too. Drywall is heavy but with strong help it is not complicated to install. You will want to install it and then pay an expert to come in and sand the joints. You then want to make sure you paint a sealer/primer over the drywall to protects it before being painted. Again, I encourage natural products like wood or adobe instead of chemically polluted drywall. Tile is best for bathrooms and kitchens. Drywall, labor, plaster texture and paint is just as expensive as doing ceilings in a nice wood so consider it heavily. Remember to watch for deals. You can get great wood flooring at auctions or clearance areas of hardware stores and flooring liquidator warehouses. Installation is easy but requires a special nail gun that can be rented for about $40 a day. Carpet does not last and it requires vacuum maintenance and stores bacteria germs and pet hair. Tile is great but requires a special cutting saw and the grout in the joints requires a lot of time to keep clean on floors. Borders, frames, base board, wall accents and ceiling crown molding is an art form. It is a bit challenging to get joints mitered just right and caulked for paint but you should at least try it before giving in to pay an expert. A wood burning stove doubles as a room warmer in the cold months. It is one of the most used items in my home. A stone mantle or raised floor fire guard is nice accent piece to any home. Again, I’m a strong supporter of natural wood. Marble and granite are nice but expensive and when they get damaged you have to live with it because it is too expensive to replace. I will take a nice hard wood with thick layers of durable clear coat any time. There are a lot of DIY kits available. Go check some out at IKEA or a similar store where they let you use computer diagrams to layout and print blueprints. I recommend you consider auctions and area salvage stores for discounted handles and hardware before over paying at stores. Antique hardware is better crafted and cleans up nicely. There are a lot of easy DIY kits available so don’t pay someone to put them together. Dish washers are a waste of space and water. The average person, washes their dishes and then still puts them in a dishwasher thinking the high heat treatment is needed to eliminate any remaining bacteria. The extra use of energy and water is just silly. Do you really need a dryer? You can hang your clothes up to dry and save a lot of money on energy bills. It may not be as big of a deal if you are generating an abundance with your solar and wind systems but a dryer is the biggest consumer of energy in a home along with a furnace. The luxury of being able to de-wrinkle or improve odors quickly is a hard habit to break but with proper preparation, you can do this just as well without a dryer. Make sure you check all the hardware store clearance isles and classified listings in the area before paying retail for an appliance. Don’t skimp on paint. Get a top quality latex paint for high traffic areas. This will minimize damages and allow for stains to be cleaned easily without the need to do much touch up painting. In low traffic or raised areas, you can use a lower quality paint with a satin or flat finish to save money. This area is unlimited with great choices. There are so many great designs that there really is no way to recommend any particulars. I do suggest that you visit tradeshows or seek out local wood workers to get ideas for custom shelves and unique wood furniture needs. Decks are a great addition. Half of our time at home should be spent outside and a relaxation center like a deck or patio encourages us to get off the couch and be active. I spend most my time in tiny home living quarters of less than 800 sq. ft. One of the first things I do when I relocate is build a deck or patio to create the extra space I need for activities. My homes usually have a small sleeping area, a cooking area and an eating area that doubles as an office and entertainment room. My workout room, greenhouse, art studio, music room and any other needed space is blended into an outdoor deck or sunroom. Decks need to have a solid foundation. If it is just a walk through area, it can be supported with basic 16×16 foundation pads on top soil but if it is an area with a framed structure and a large gathering space, it will need concrete pillars 2 feet deep. The frame needs to be treated and/or rot resistant wood. There are a lot of options for decking. I suggest colored concrete for patio like areas and regular pine lumber elsewhere with a combination of tile or stone accents. The lumber needs water treated and stained every two years but the added cost of composite or using treated wood for the entire deck is not worth $100 of stain and 2 days of your time every two years. The lumber should be held together with weather proof screws with high torque heads. (NOT your normal Phillips bit head.) In most applications a hidden spacer bracket (Deck Lock) can be used to minimize visible screw heads. Composite warps and fades under the elements just as fast as standard pine wood so it is not worth the extra cost. Patios are one of my most enjoyable projects to design and implement. They set the tone for the surrounding landscape plan. A combination of rock, stone and colored/stamped concrete is amazing. Brick and block pads will eventually frustrate you as they catch dirt allowing weeds to seed and grow. You will want any gaps to either be hairline thin or larger than a half inch wide. Gaps less than a half inch will trap dirt and sand and need continuous cleaning. Sun Rooms have improved in design since the last time I built one so I will add more to this section after I do the next one. For now I just want to make sure you choose products that are energy star rated. There are still single pane glass options out there and they need to be avoided. You will not be please with the buildup of condensation and moisture damage and staining caused by single pane glass. You will also be dissatisfied with the noise pollution and lack of insulation for climate control. I am available to stay a week at a time on any special projects you may have to help manage your contracting needs. – Framing; Roof; windows; doors; floors; trim; paint; wood ceiling; electric prep and fixture install; decks; sunrooms; renewable energy system installs; gutters; siding; soffit/fascia; closets; custom wood features; landscaping; fencing and cement patio features. *Everything else, I can help sub-contract to others for you. If you are using a general contractor of your own, they will add 15-20% on top of my prices. I recommend you leave the floors; trim; paint; wood ceiling; fixture installs; decks; sunrooms; renewable energy system installs; gutters; siding; soffit/fascia; closets; custom wood features; landscaping; fencing and cement patio features OFF the contract and pay your friends or family directly for these services. Helping Hands Comic Issue #11 coming soon!